Koh Yao Yai Village Phang Nga Address : 78 Moo 4, Koh Yao Yai, Amphoe Koh Yao Phang-nga 82160 Thailand. Koh Yao Yai Village Phang Nga 9 out of 10 From 2,333 Baht (77 USD) 2 ratings. 5 user reviews. The Island Hideway is a private and peaceful retreat on the gentle shores of Koh Yao Yai that captures the enchantment of an un-spoilt heritage. Upon arrival to Koh Yao Yai Village, one enters through a sub-tropical rain forest past rice fields and rubber plantations into an expanse of natural shade of evergreen trees adorning the inner sanctuary. Accommodation comprises of 34 detached spacious Deluxe Bungalows of 73 sq m., with full amenities. 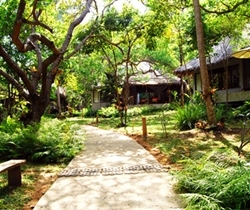 All rooms are set individually within a peaceful 32 acre natural landscape of flora and fauna. Koh Yao Yai Village is really good at service, we had warm welcome. Room was also clean, all around the resort was nice.